Merry Christmas everybody! I love Christmas, and it's really interesting how the traditions vary from country to country. Being from Peru, there is a lot of things we do differently down there. This is my first Christmas in the United States (actually my 2nd but I was 6 years old during the first one), and here we are eating turkey, apple sauce, sweet potatoes, rice and Panetone. Also, it's usually summer in Peru in December so I have endless Christmas photos in shorts and flip-flops. Of course we don't grow Christmas trees down there so everyone has an artificial tree. I was actually shocked recently when I found out that here people actually go out and buy real ones!! I can't wait for the day I have my own house and can go out with my family and buy a beautiful honest-to-god Christmas tree. I think Christmas tree lots with those lines of light bulbs hanging high above the trees are so beautiful. They are like little temporary, seasonal installations. 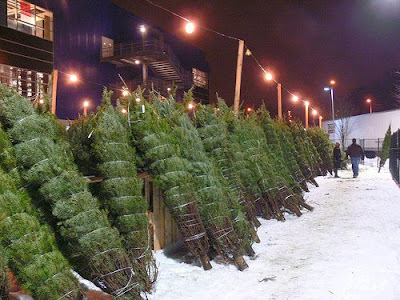 And then all the old trees tossed on the curbside after Christmas are the only evidence marking the existence of these temporary twinkling tree lots. The funny thing is, that even thought this year we opted for a cold white Christmas, it ended up being 65 degrees on Christmas day. Hooray global warming!